Taken last Christmas. 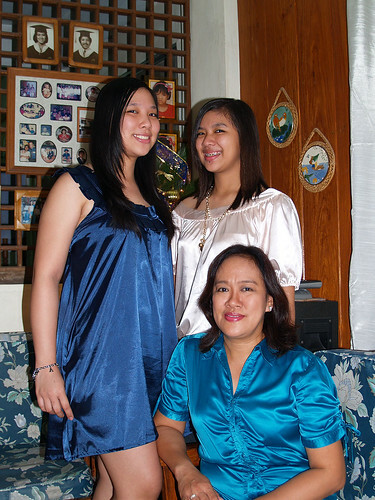 Mama chose Blue for 2007. She made it a family tradition for us to dress in a specific color/theme every Christmas for our annual family portrait. I won't show you the actual family picture. Because I look hideous. That's Mom and my two sisters, Diana and Donna. Dunno why Donna's not wearing blue. There has indeed been a surge of blue on the runways in the last year, beginning last February with Raf Simons’s dresses and pantsuits, in an Yves Klein blue, for Jil Sander and extending into the spring 2008 collections with Nicolas Ghesquiere’s explosive floral prints for Balenciaga. Mr. Elbaz used a deep lagoon blue in his spring Lanvin show, and one found lighter but no less robust shades in collections by Marni and Chloé, and in the men’s lines of Prada and Alexander McQueen. Dolce & Gabbana called its new fragrance Light Blue. And JWT, the advertising and marketing company, just named blue as one of the top 10 trends for 2008, saying that “blue is the new green", particularly as it denotes ecological concerns.